Haven’t decided on a hotel yet? You can look at other available hotels in the regions of Limousin and Auvergne with Booking.com. 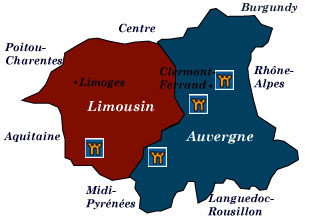 The regions of Limousin and Auvergne make up part of the great Massif Central, an area of wild beauty with enormous, extinct volcanoes, windswept plains, and river-cut canyons. Romans, Visigoths, Saracens, Catholics and Huguenots have all battled over the region, as attested by the scattering of castle ruins. Splendid Romanesque churches sit in town squares. The area has always been a crossroads for pilgrims, both ancient and modern. Many visitors overlook the area in their rush to France’s south. Country roads are delightfully uncongested, and villages haven’t completely given over to the tourist euro. If you appreciate natural beauty, lots of outdoor activities, and rural simplicity, you won’t be disappointed by spending some time here. Limoges is world famous for its fine enamelwork and porcelain. The best place to start is at the Musée National de la Porcelaine Adrien-Dubouché, which has over 10,000 pieces on display, and the Musée de l’Evêché-de-Limoges. The medieval villages of Corrèze are charming places in which to pass an idyllic afternoon. Uzerche, Turenne, and Collonges-la-Rouge are good for starters. Parc Naturel Régional des Volcans d’Auvergne You don’t have to be a vulcanologist to appreciate the special scenery in this nature park. Eighty volcanoes, dormant for about 5000 years, have their craters, domes, and dikes all on display for the curious. Puy de Dôme, at 1465 m (4800 ft), has a road that spirals up to the peak. At the summit you have not only a fantastic view and a telecommunications tower but the traces of a Roman temple devoted to Mercury. Vichy The hot and cold springs in this fashionable spa town have been popular since Roman times. The Parc des Sources in the center of town is filled with Belle Époque charm and an old-fashioned bandstand that presents afternoon concerts in season. Le Puy-en-Velay Situated in the bowl of a volcanic cone, the little town of Le Puy appears to have three peaks, each topped by a religious structure. The medieval section of town has not changed much in 800 years. Le Puy is also considered a pilgrimage center because of its famous Black Madonna in the Cathédrale de Notre-Dame, built on an early pagan site.